HELLO all my wonderful, amazing Lovelies! Yes, it has been a lifetime since I've been able to post anything. Between having surgery back in June and moving to a new state, and my daughter starting kindergarten, I have been one busy little bee! During this time, I have come to a decision about what to do with this blog. I don't think I can maintain it the way I used to; feeling self-applied pressure to read all the time so I could have something to post about and spending hours researching book news and on and on. So what I've decided to do is change the direction of my beloved blog from strictly book reviews to pretty much whatever I want. I will continue to read and review YA books because that is my true love, however, it will be at my leisure - so basically whenever I have the time to read, I will review the book just minus the pressure of trying to make it a weekly thing. But I will also review other things, like movies (which I did a little bit of too), tv shows as well as discuss anything else I feel will interest the general public. I may not sound like much is changing, and there isn't, but I feel more at ease giving myself the freedom to post when I can and being able to discuss whatever else I find interesting. This will no longer be a strict book-blog. The changes will not be immediate, but I hope you will continue to check in and come back often once the shift has been made. I love my followers and I have missed you so! 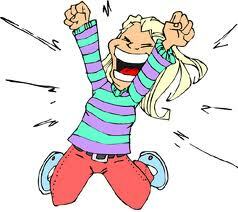 Are you guys just as excited about The Lost Prince by Julie Kagawa as I am? The Iron Fey is by far my favorite "faery tale" so when I heard that Kagawa was continuing the story with Ethan Chase, happy was just not a strong enough word to describe how I felt! Before I share the summary for The Lost Prince, I just wanted to say how much I love when an author creates a spin-off from one of their original series. To me this says a lot about an author; that they can see how much their fans loved the story and heard our cries for more, therefore giving it to us! That is an author who truly cares about her readers! Thank you! I'll shut up now :D...here's the back flap summary for The Lost Prince coming October 23rd! That is Ethan Chase's unbreakable rule. Until the fey he avoids at all costs—including his reputation—begin to disappear, and Ethan is attacked. Now he must change the rules to protect his family. To save a girl he never thought he's dare to fall for. Ethan thought he had protected himself from his older sister's world—the land of Faery. His previous time in the Iron Realm left him with nothing but fear and disgust for the world Meghan Chase has made her home, a land of myths and talking cats, of magic and seductive enemies. But when destiny comes for Ethan, there is no escape from a danger long, long forgotten. This sounds SO exciting and all kinds of wonderful! Julie Kagawa hints at the reappearance of some of favorite characters, like Grimalkin and of course, ASH!!!!! Oh the chills I get just thinking about it! Hello my wonderful lovelies! I had to take a short hiatus to finish up school and take care of some personal matters but now that school is over and there are a few things in the works, I thought I'd try to get back in the blog-swing of things. Hope you enjoy this Tuesday Review! Synopsis: In a future world, Vampires reign. Humans are blood cattle. And one girl will search for the key to save humanity. I love the Iron Fey, I mean I ate that series right up; so when I read The Immortal Rules, I was very disappointed when I almost fell asleep! You might be wondering why I still gave it four stars, let me explain. 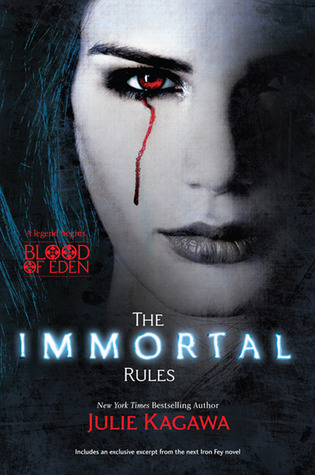 Allie's story begins before she was made into a vampire; her scavenger-type life; fighting to survive, living by rules and in fear no human should ever have to. The characters in this part were a little superficial and I feel too much time was wasted in telling this part of the story. The middle of the story is after she is turned, the time she spends with her maker learning how to live as the thing she has feared her entire life and the thing she hates the most. Finally, the last part of the story is the time she spends with this group of traveling humans that are looking for Eden - a vampire free place that no one is sure even exists. Here's what put me to sleep: throughout the story, Allie is fighting the vampire she has become and is trying to be as human as possible. Understandable, I guess for a time any one of us might try to maintain normalcy for as long as possible; however, in my opinion, there comes a time where acceptance is the only path left. I like my vampires to embrace their inner monster from time to time. I mean, if you're going to be supernatural, act like it!! I think this story could have been told just as well in less pages. There was not enough important things happening to fill up these 480 pages, but a lot more story than I think was necessary. The reason I still gave it four stars is because I can see the potential for this story. I think Allie might have an interesting background if I just stick it out until the end. The rest of the story and characters seem to serve only as ties to Allie and her humanity and maybe only one of them is essential to the actual plot. Overall: I look forward to the sequel, I just hope that if it's going to be just as long that it isn't full of fluff but actual plot points and meaning. DESTINED by Aprilynne Pike - Chapter One!!! OMG have you seen this? Have you read it? 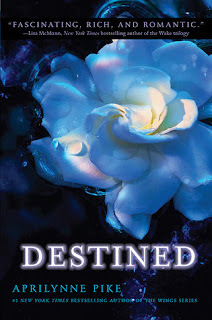 Aprilynne Pike posted the first chapter of DESTINED yesterday on her blog and here it is! Plus, she will be posting more teasers up until the release, so be sure to check her blog for updates! Tamani pressed his forehead against the chilly window-pane, fighting back a wave of exhaustion. Sleep wasn’t an option, not while the only thing between him and an angry Winter faerie was a thin line of table-salt. Tonight, he was Fear-gleidhidh twice over. The old word was one he normally wore with pride. It marked him as Laurel’s guardian, her protector. But it had a richer meaning, one that went beyond the more traditional Am-fear-faire. Fear-gleidhidh meant warden and Tamani was charged with not only keeping Laurel safe, but making certain she accomplished the mission Avalon had given her as a child. Now he played prison warden, too. He looked over at his captive. Yuki’s chair sat on the scuffed linoleum in the middle of a thick circle of white, granular salt. She slept, her cheek resting on her knees, hands remained cuffed loosely behind her. She looked uncomfortable. Beaten. “I would have given up everything for you.” Her voice was hushed but clear. Not sleeping after all. And she could never be harmless, he reminded himself. The small white flower blooming from the middle of her back, marking her a Winter faerie, was proof enough of that. It had been over an hour since David cuffed her to the chair—an hour since Chelsea had exposed the irrefutable proof that she was, in fact a Winter faerie—and Tamani still hadn’t gotten used to the sight. It filled him with an icy fear he had rarely felt before. Tamani held his tongue. He had known. And for a moment he’d been tempted to let her make her confession. But it wouldn’t have ended well. Yuki would eventually have discovered that his affections were a sham, and then he would be at the mercy of a Winter faerie scorned. Better to cut the charade short. He hoped he wasn’t deceiving himself about that. She posed a threat; he shouldn’t have felt any guilt about lying to her in the first place, much less now that he knew she’d been lying too. The power Winter faeries had over plants also made it possible for them to sense plant-life at a distance, so from the instant Yuki had met Tamani, she had known him for a faerie. Known Laurel, too. She had played them all. So why did he still wonder whether he’d done the right thing? Avoiding his captain’s eyes, Tamani turned back to the window and peered out into the darkness, pretending to look at . . . something. Anything. A sentry’s life was full of viciousness and Tamani and Shar had both seen each other take extreme measures to protect their homeland. 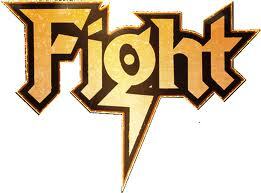 But always against an obvious threat, a violent attacker, a proven foe. Trolls were their enemy—had always been. Winter faeries were the rulers of Avalon and though Yuki had deceived them, she’d never actually harmed them. Somehow, putting her in chains felt worse than killing a hundred trolls. Reluctantly, Tamani glanced at her again. He was surprised to see that she wasn’t looking at him as she spoke—she was staring past him, out the window, as if at some bright future she still imagined possible. Tamani knew better. “How do you know about the palace?” Tamani asked reflexively, knowing even as he did that he was snapping at her bait. A barely audible sigh came from Shar, and Tamani wondered if it was directed at Yuki’s stupidity or his own. Tamani wondered if she understood just how right she was—or how little it tempted him. “I would have loved you forever,” she whispered, bowing her head. Her dark, lustrous hair fell forward, veiling her face, and she sniffled quietly. Was she crying, or stifling a laugh? Tamani startled when a knock sounded at the door. Before he could take a step, Shar moved silently to the peephole. Knife in his fist, Tamani tensed—ready. Was it Klea? That’s what everything was for—the circle, Yuki in cuffs—an elaborate trap to snare the scheming Fall faeriewho might be trying to kill them. If only they could know for sure. Until they did, Tamani had to assume they were a threat—a lethal one. But with a shimmer of a grimace Shar pulled the door open and Laurel entered the room, Chelsea close behind her. 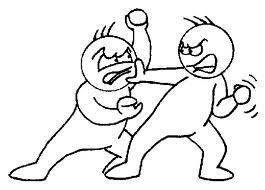 “Laurel,” was all Tamani managed to say, his fingers falling from the knife. Even after loving Laurel for as long as he could remember, and lately becoming something . . . something more, he still felt a leap of joy every time he saw her. She had changed out of her dark-blue formal—the one she’d worn when he held her in his arms over a year ago at the Samhain festival, when he’d kissed her so passionately. It seemed so far away. Laurel wasn’t looking at him; she only had eyes for Yuki. “You shouldn’t be here,” Tamani whispered. Tamani clenched his teeth. In truth, he did want her there, but his own selfish desires were at odds with his concern for her safety. Would he ever be able to satisfy both? “I thought you were going after David,” Tamani said to Chelsea, who was still in her deep-red formal. She’d ditched her heels somewhere, so the bottom of the dress pooled at her feet like blood. “I couldn’t find him,” Chelsea said, her lip quivering almost imperceptibly. She looked at Laurel, who was still studying their silent prisoner. The Winter faerie’s venomous tone seemed to hit Laurel like a breaking wave and she took a step backward. “I came to check on you.” Laurel glanced at Tamani, but Tamani wasn’t sure what she wanted. Encouragement? Permission? He offered her a pained grimace and a tiny, helpless shrug. Laurel turned back to Yuki, the Winter faerie’s expression unreadable, her chin held high. “What does Klea want from me?” Laurel asked. Laurel’s eyes darted to Tamani, then to Shar, before returning to Yuki. Tamani hated that she was right—that Laurel wouldn’t be able to deny it. “No deal,” Tamani said, doing his best to sound bored. Tamani frowned; what did Laurel’s parents have to do with anything? “Oh, come on—” Tamani blurted. Tamani was pretty certain of the answer, and he knew Laurel was too—it had to have been Klea. But if Laurel could convince Yuki to confirm their suspicions . . .
Again Laurel looked at Tamani, and he shook his head with a tiny shrug. What was Yuki playing at? “That’s enough,” Tamani said sharply. He should have guessed; more games. Yuki was just looking for ways to get them doubting themselves—and each other. Congratulations Ashley! Email me with your pick of any March 2012 new release (along with shipping info) to get your copy! GIVEAWAY - Enter Before It's Too Late! Don't forget, this is the last week to enter my March 2012 New Release Giveaway! Follow the link or the picture for full details but here's the gist of it: leave a comment and if you win, I will buy you any March 2012 new release of YOUR CHOICE! But please read the details before entering. The giveaway ends Saturday, March 31st at 11:59 p.m. EST and the winner will be announced the next day. So hurry and enter before it's too late! Good Luck! Waiting on Wednesday is a meme created by Breaking The Spine to highlight upcoming books that readers are dying to get their hands on, but this week it's a YA movie that I can't wait for! If you're excited about this too, you have to READ THIS before you go any further! Did you read it? Awesome, right? I know. Harald Zwart sounds like an amazing director and I'm starting to get good feelings about this flick! I LOVE this series so naturally I'm really hoping they do it right. The production team has a lot of work to do and even more expectations to live up to. I'm not sure who those other guys are but this looks like a pretty good cast to me! 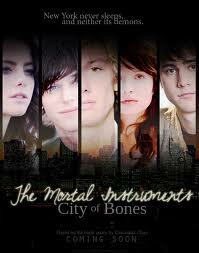 As we all know by now, so far only Lily Collins has been cast to play Clary Fray. 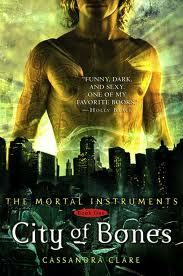 Personally, I think Alex Pettyfer is the only man that could be Jace. I think Jamie Campbell Bower is too young in the face and doesn't do back-off-I'm-dangerous very well either. 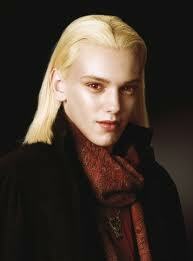 This is him in New Moon as Caius; just one of the most (supposed) ruthless in the Volturi coven. I'm sorry but...I'm just not buying it. This look doesn't say "fear me"; it says "Meow. Grr baby, yeah!" - say that in you're Austin Powers voice and you got it. I want Jace's actor to strike me as someone that I need to keep an eye on and at the same time, someone I can't take my eyes off! So yeah, that's what I'm waiting for. You? Synopsis: Much has changed since autumn, when Kelley Winslow learned she was a Faerie princess, fell in love with changeling guard Sonny Flannery, and saved the mortal realm from the ravages of the Wild Hunt. 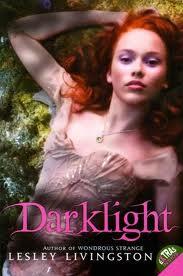 With breathtakingly high stakes, the talented Lesley Livingston delivers soaring romance and vividly magical characters in Darklight, the second novel in the trilogy that began with Wondrous Strange. My Review: Within the connection Sonny and Kelley have, a ton of lies are woven; those told to them and by them. Her parents have been keeping secrets and secrets have even been kept from them. When a stranger attacks Kelley in Central Park all hell breaks loose when Kelley opens a rift that drops her and the Fennrys Wolf in the Otherworld. Sonny and Kelley are a really cute couple but because of the danger that surrounds them both, they spend a lot of time apart. This leaves Kelley spending plenty of one on one time with the Wolf. No bueno. Some of the other characters come into play in this book but the Puck here is SO not the Puck I knew in the Iron Fey! THAT Puck would never run from a fight! Queen Mabh is another character we get to see more of in this sequel. I've always known Mabh to be the frigid Ice Queen of Winter but in this faery tale, she is the Queen of Autumn...and not so very frigid. I'm not quite sure what to make of her yet, but I'm keeping a close eye on her! I do not trust Auberon as far as I could throw him - and as a mortal I'm sure that wouldn't be far at all. I don't trust the Summer Queen, Titiana, either. I've learned enough not to trust a faery who appears to be trustworthy. Especially the royal ones. I'm pretty sure Titiana is the one who started this whole thing in the first place, from blowing Mabh's war horn to everything else. This sequel was equally exciting as the first. So many twists and turns and reveals it makes your head spin! plus, while truths are coming to light, the fact that we still don't know half of what's going on is also revealed. I wish there was more I could tell you but I'm afraid I might spoil something. So just know that it was AWESOME and a MUST-READ! 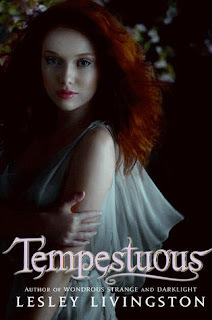 Overall: I was very disappointed with the ending and I'm counting on Tempestuous to rectify the wrongs made in Darklight. Waiting on Wednesday is a meme created by Breaking The Spine to highlight upcoming books that readers are dying to get their hands on. Confession: I have not read Beautiful Chaos yet but I fully intend to; I just haven't gotten around to it. Although this will be the last book in the series, we still have the Beautiful Creatures movie to look forward to - set to come to theaters March 13, 2013! 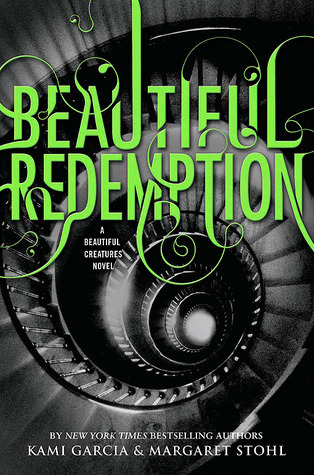 No synopsis has been released yet for Beautiful Redemption but I'll be sure to keep and eye out for it! Are you waiting for anything special?